I don’t have a Facebook account and it annoys me when I get redirected there just in my daily browsing (polls, article links, and others) and I can’t participate or it requires a few extra clicks to get where I want. Even more annoying than those redirects are having to see the Facebook Like button on tons of different pages. I don’t care how many people like something else unless there is also a dislike option and when I can’t participate because I lack a Facebook account. To filter this out in Firefox with the Ad-Block Plus addon installed, I right-clicked on the next Like button I came across and chose ‘AdBlock Plus: Block Frame…’. 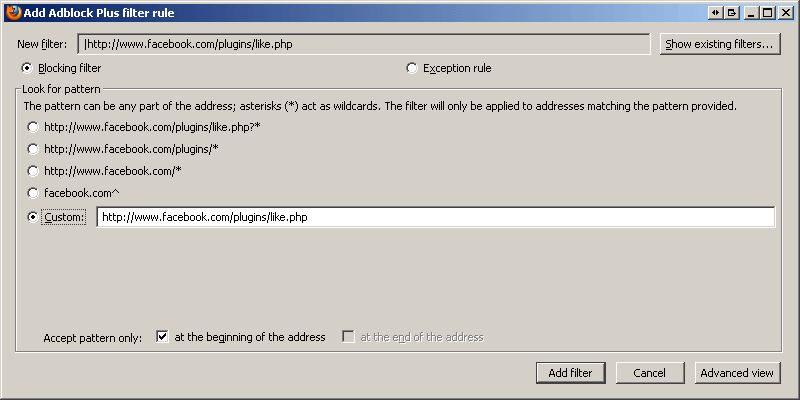 I then chose to add a custom pattern filter and added “http://www.facebook.com/plugins/like.php” and hit the Add filter button. After adding that filter and refreshing the page, no more Facebook Like buttons on that page I was viewing or any after it.